When increased pressure within a confined space results in reduced blood flow, it is known as a ‘compartment syndrome’. The reduced blood flow can potentially lead to muscle death and nerve damage in the affected extremity. Fortunately, limber tail is usually benign, and resolves on its own within a few days. 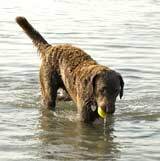 It can, however, sometimes be quite painful for the dog, and occasionally leads to a permanently altered tail posture. Some signs of limber-tail syndrome can include pacing and trying to lie down in many different spots, yelping when sitting down, wanting to go out to defecate many times, and straining to defecate. The actual tail will also usually be limp, hanging downwards or in an unusual position for the dog in question. In general, hunting dogs are most at risk during the first few trips in cold water or foul weather, when their muscles lack conditioning from lounging about during the off-season. The risk of limber tail can be mitigated by conditioning dogs before a long day of exercise, and ensuring that they have a chance to rest afterwards – preferably somewhere warm and dry, with enough space to stretch out and alter position. As with any muscle injury, the key to recovery is rest, rest, rest, and possibly a warm compress. In addition, NSAIDs (non-steroidal anti-inflammatory drugs) can provide pain relief and may shorten the recovery time. Dog-safe NSAIDs, such as those used for osteoarthritis, are available from veterinary clinics. In a healthy, adult dog with no known gastrointestinal problems, a low dosage of aspirin (contact your vet for exact dosage/possible reactions) may be sufficient for the short-term. Usually after a few days of rest, the tail will return back to normal. Due to the fact that symptoms of limber tail can mimic other medical problems, it is imperative that your dog be seen by a veterinarian. I have read up about limber tail, and they all say the dog will recover. However, my friend has a black Labrador who has had this for quite a while, and has been seen by the vet. It has reached the stage whereby he cannot lift his tailing when having a poo! He has to be cleaned up afterwards, and has sudocreme applied. He is a delightful natured dog, and this is very uncomfortable for him. Is there anything else that can be done? Can it be reversed? ….. It has gone on for months.